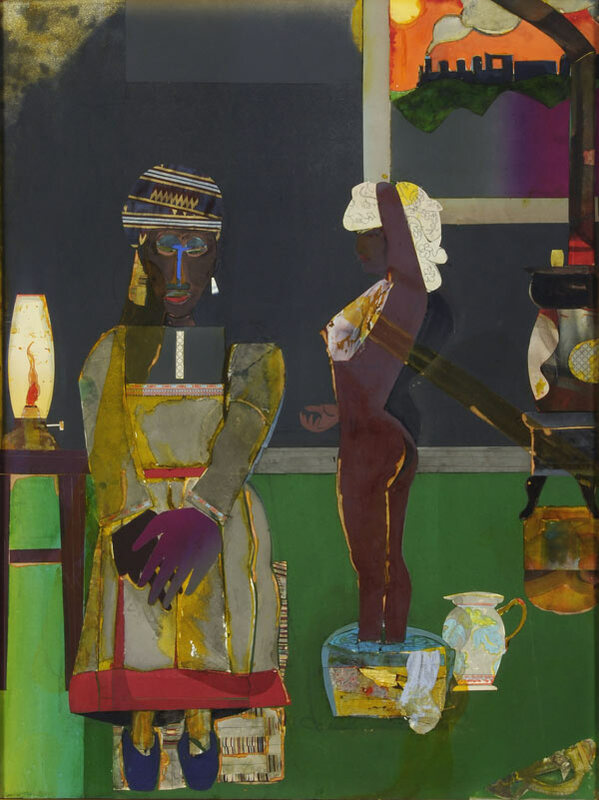 Romare Bearden, Prelude to Farewell, 1981, collage, 49 x 37 ¼ in., Courtesy The Studio Museum in Harlem, Gift of Altria Group, Inc.
(CATSKILL and HUDSON, N.Y.) – The much-heralded exhibition “River Crossings: Contemporary Art Comes Home,” a landmark collaborative exhibition of contemporary art at the Thomas Cole National Historic Site and the Olana Partnership/Olana State Historic Site highlighting the pivotal role that the two historic properties – and the artists who lived and worked there – played in shaping America’s culture of contemporary art, opens on Sunday, May 3, 2015, and run through November 1, 2015. It will provide an unprecedented opportunity for visitors to consider these historic spaces from a completely new vantage point – that of experiencing contemporary art in these iconic settings. The artists whose work is included in the exhibition are Romare Bearden, Elijah Burgher, Chuck Close, Will Cotton, Gregory Crewdson, Lynn Davis, Jerry Gretzinger, Don Gummer, Duncan Hannah, Stephen Hannock, Valerie Hegarty, Angie Keefer with Kara Hamilton and Kianja Strobert, Charles LeDray, Maya Lin, Frank Moore, Elizabeth Murray, Rashaad Newsome, Thomas Nozkowski, Stephen Petegorsky, Martin Puryear, Cindy Sherman, Sienna Shields, Kiki Smith, Joel Sternfeld, Letha Wilson, and Elyn Zimmerman, in addition to selected complementary work by Thomas Cole and Frederic Church from the permanent collections. Stephen Hannock, the celebrated painter and heir to the Hudson River School tradition of landscape painting, and Jason Rosenfeld, PhD, the art historian who recently curated two enormously popular exhibitions at Tate Britain in London and the National Gallery in Washington, DC, curated the exhibition. The exhibition will take place in the residences and surrounding landscapes of the Thomas Cole Historic Site – home of Thomas Cole (1801-1848), founder of the Hudson River School of art, the first distinctly American art movement – and Olana, the 250-acre home and landscape created by Frederic Edwin Church (1826-1900), Cole’s student, who became world-renowned as the School’s leading practitioner. The properties lie two miles apart, directly across the Hudson River from each other and connected by a bridge. In describing the show, Stephen Hannock explains that artists have visual conversations with their predecessors across time, and that he in particular has long been influenced by Thomas Cole and Frederic Church and in conversation with them through his art. This exhibition continues that dialogue by bringing outstanding works of contemporary artists into the homes of these two historic figures. 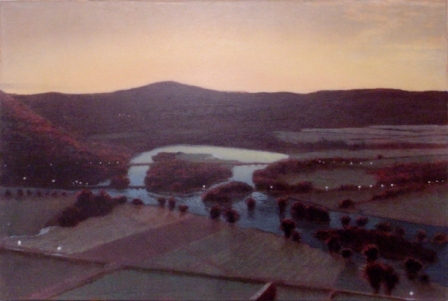 The works in the exhibition represent a wide range of styles and a broad diversity of artists, but the artists all have a connection to the region that Cole and Church helped ignite as a hot-bed of innovative contemporary American art: from Greater New York City to Lake George and from Niagara Falls to Massachusetts. The exhibition reflects the co-curators’ choice of art and artists to participate in that continuing conversation. Contemporary art is not new to the homes of Thomas Cole and Frederic Church. Cole placed his own work, likely still wet from the studio, onto the walls of his west parlor, and Church frequently displayed his work and that of friends on the walls at Olana in curated arrangements. Both homes were alive with visitors coming to see the artists and the latest in contemporary painting. 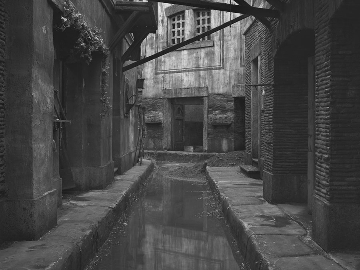 But this is the first time since the 19th century that contemporary artists have been invited to present work in the context of the historic rooms and the landscapes of the two properties. It is also the first time that these two sites have formally collaborated on such a major scale to present a two-venue exhibition that crosses the Hudson River. Cindy Sherman, Untitled #501, 1977/2011, Gelatin silver print 8 ¾ x 6 ? in. Courtesy Artist and Metro Pictures. The exhibition’s hardcover companion book – also titled “River Crossings: Contemporary Art Comes Home” – will include a foreword by historian Ken Burns on the Hudson River Valley as an ongoing inspiration to artists, essays on the exhibition by both curators as well as cultural historian Maurice Berger and cultural writer Marvin Heiferman, and an afterword by essayist Adam Gopnik. Together the exhibition and the book explore the relationship between past and present and consider new ideas about the meaning of the art and history of the mid-19th century and its resonance today. The Thomas Cole National Historic Site is the place where American art began, as it is the home of Thomas Cole (1801-1848), the founder of the Hudson River School – the first major art movement of the United States. Cole’s landscape paintings encompassed a new-found awe for the majesty of the American landscape, and they sparked the longest-running art movement in American history, including more than 100 artists in the period between 1825 and about 1870. Today, the National Historic Site welcomes thousands of visitors each year. Thomas Cole’s original easels and art-making tools are on view in his “Old Studio”, and a film about Cole and the Hudson River School can be seen in the visitor center. Visitors especially enjoy the panoramic view from the west porch to the Catskill Mountains, which remains strikingly similar to Thomas Cole’s paintings of the same view. The eminent Hudson River School painter Frederic Edwin Church (1826-1900) designed Olana, his family home, studio, and estate, as an environment integrating architecture, art, landscape, and conservation ideals. Considered one of the most important artistic residences in the United States, Olana is a 250-acre artist-designed landscape with a Persian-inspired house at its summit, embracing unrivaled panoramic views of the vast Hudson Valley. Olana State Historic Site, a historic site administered by the New York State Office of Parks, Recreation and Historic Preservation, Taconic Region, is a designated National Historic Landmark and one of the most visited sites in the state. The Olana Partnership, a private not-for-profit education corporation, works cooperatively with New York State to support the restoration, development and improvement of Olana State Historic Site. 2016 will mark the 50th anniversary of this public/private partnership.